October is Bullying Prevention Awareness Month, according to StopBullying.gov — a federal website that is suspiciously still operating during the government’s draconian 17% shutdown. The official website defines bullying as “unwanted, aggressive behavior” that involves “a real or perceived power imbalance.” Instead of focusing on grade-school toughs administering swirlies and wedgies, government should focus on the far more sinister bullying from their own bureaucracy. 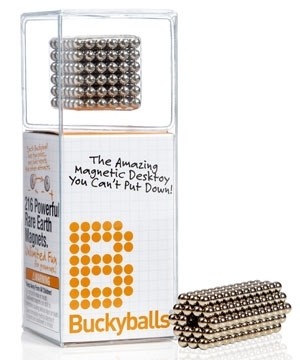 A businessman named Craig Zucker sold sets of small, strong magnetic spheres called BuckyBalls. In 2009 his creation became an Internet sensation and by the following year his company had $10 million in sales. Instead of celebrating this American success story, the jobs it created, and the increased tax revenue, the Obama administration decided to bully Zucker’s little company. In 2011, the Consumer Product Safety Commission arbitrarily deemed BuckyBalls to be inherently unsafe. From the 2.5 million sets sold, the CPSC documented five (five!) cases of children swallowing the executive toy. Despite the miniscule 0.0002% failure rate, our government nannies ruled that the tiny round menace had to be stopped. To his credit, Zucker fought the ban with a fun public relations campaign mocking the government’s silly overreach. Nevertheless, the federal bullies forced Zucker to shut down his profitable business. But that wasn’t enough. As C.S. Lewis once said, “above all else, the Devil cannot stand to be mocked.” The government had to make a personal example of Zucker. The commission filed a motion requesting that Mr. Zucker be held personally liable for the costs of the recall, which it estimated at $57 million, if the product was ultimately determined to be defective. This was an astounding departure from the principle of limited liability at the heart of U.S. corporate law. CPSC’s goal is no longer to protect kids from bite-sized magnets — BuckyBalls are off the market. Their only goal now is to personally destroy Zucker for daring to question ridiculous federal bureaucrats. The inventor is now selling a larger version of his popular product and named them LibertyBalls. The profits will go toward Zucker's legal fees as he stands up for rights of American consumers, businesses, and individuals. The Obama Administration is using “unwanted, aggressive behavior” that involves “a real power imbalance.” By their own definition, they are bullies. Thankfully, StopBullying.gov shows how they can resolve the problem. The CPSC must write a letter apologizing to Zucker, do good deeds for his fired employees, and pay for all the damages done to the company that they destroyed. But the agency better hurry — Bullying Prevention Awareness Month only lasts three more weeks. This is rediculous. It nothing more than pure intimidation. Minnesota experienced a win for liberty recently when the state reformed regulations on in-home food businesses. According to the Institute for Justice, almost every state has regulations, called cottage food laws, that limit the sale of food out of the home. However, until last month Minnesota was one of the strictest states, allowing many bakers to sell their products only at farmers’ markets and events, and capping the amount they could earn annually to $5,000. Boeing’s first quarter reported earnings surpassed Wall Street estimates and its stock price is up about 20 percent over the past year. Why is the Government Regulating Lyft and Uber? This morning I used Lyft to get to work. My driver conveniently picked me up in a nice, clean, air-conditioned car all the way out in Falls Church, VA (30 minutes away from DC), and he drove me to the Capitol for just $25. Despite the fact that the vast majority of black voters are Democrats and support President Obama, there’s a growing anti-establishment, anti-Democrat and anti-Obama trend that’s percolating in the black community. On Friday, May 2, the White House was happy to announce the lowest US unemployment rate since September 2008. As reported by the Bureau of Labor Statistics, with 288,000 nonfarm jobs added to the economy, the unemployment rate dropped from 6.7% to 6.3% in April 2014. "As Economy Stalls, Democrats Remain Out Of Touch With Voters"
"According to a Gallup poll, economic problems dominate in the question of the most important problem facing the nation today. This makes the priorities championed by Democrats all the more puzzling. " Economists are now reporting what we all know already - America's economic growth has ground to a halt. Wednesday's report from the Commerce Department was bleak. The expected growth in GDP was 1.1%, but the Commerce Department is now reporting a rate of growth of only 0.1%. This has been felt for a long time by average Americans. According to a Gallup poll, economic problems dominate in the question of the most important problem facing the nation today. This makes the priorities championed by Democrats all the more puzzling. As we struggle to sustain an economic recovery that has been charitably described as "choppy", Democrats continue to push an agenda that is out of touch and fails to solve the underlying problems. The Lie Of The Gender Wage Gap As Reported By ... Slate Magazine? Slate Magazine published something remarkable this week - and I'm not referring to the drivel about you being evil for wanting to give your kid the best education available. No, in this case, remarkable is a good thing. Craig Daliessio isn’t by nature an angry man. But recent events have brought him to the end of his rope.“The past five years have just worn me down,” he told me over the phone. He couldn’t help but write about his experience.After years of economic struggle, the loss of his home, and failure to find steady employment, Daliessio shared “An Open Letter to Barack Obama,” which is spreading quickly on blogs and social media.